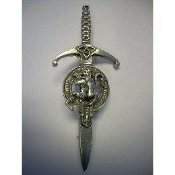 The Scotland Yard offers over 200 Clan Crest Kilt Pins by Gaelic Themes. The Gaelic Themes Clan Crest kilt pins and Clan Crest cap Badges are more durable and are available in more Scottish Clan Names than the pins and Badges from Art Pewter and other pin and badge makers. These pins are sturdy with a matte finish, making them perfect for evening or day wear. A wonderful gift. Size is 3.5 inches long.